Pope Francis begins his Apostolic Journey with a brief message in the book of honour at the Presidential Residence Áras an Uachtaráin Pope Francis' first stop in Ireland is the Presidential Residence, Áras an Uachtaráin, where he is meeting with Irish President Michael Higgins. In a brief ceremony, the Holy Father penned a brief message, to the Irish people in the book of honour: "With gratitude for the warm welcome I have received , I assure you and the people of Ireland of my prayer that the Almighty God may guide and protect you all." 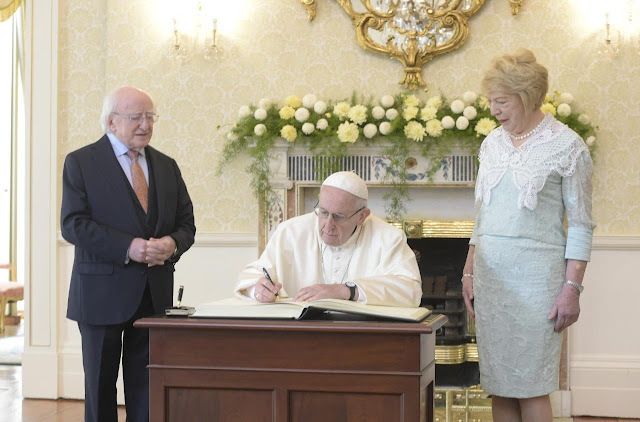 The Pope is paying a courtesy visit to the President, before transferring to Dublin Castle, where he will address government authorities, leaders of civil society, and members of the diplomatic corps.